Uglyworld #381 - Ice-Bat's New Favourite Drink - Ginger Beer (69-365), originally uploaded by www.bazpics.com. 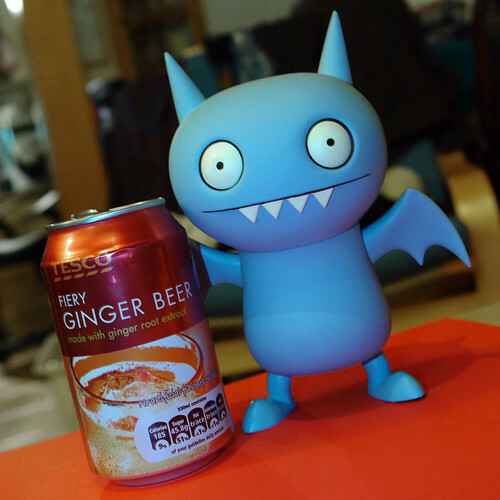 Since returning from the trip to Cambridge the little guys have all been enjoying the various biscuits, cookies and cakes that we brought back with us, but sneak Ice-Bat managed to find my own personal stash of goodies which included 4 cans of Ginger Beer. I've been so busy with work since returning to Aachen that I hadn't been paying attention to my secret stash hidden away in one of the kitchen cupboards, until I heard the sound of Ice-Bat slurping the last drops from one of the cans of Ginger Beer. Looks like I'm going to have to keep the rest of the goodies under lock and key if I expect to enjoy them myself. Share and share alike, don't you think?